Stourbridge's FA Cup pedigree will mean the non-league side will not fear anyone in the first round of the FA Cup, says midfielder Matt Dodd. Dodd scored the seventh-tier side's first goal as they knocked out National League strugglers Kidderminster Harriers 3-0 to reach the first round for the fourth time in seven years. "Stourbridge always seem to be in the mix," Dodd told BBC WM 95.6. "We won't fear anybody, we'll give it a really good crack and see where we go." Personal trainer Dodd put the Glassboys in control of their fourth qualifying round tie at Amblecote before further strikes from ex-Harriers striker Justin Richards and midfielder Chris Lait completed a comfortable win. Richards, a former West Bromwich Albion trainee, scored 22 goals in a two-year spell at Aggborough between 2007 and 2009 but was not surprised his old club were swept aside so easily. "If I'm honest, no," he said. "I say that not out of disrespect to Kiddy, but the fact is they've not been going well and it was a game that if we got at them early they might not come back from that." Cannock engineer Lait's second goal - a curling finish after a strong run - helped set up another big FA Cup occasion for the Glassboys and one they are determined to savour. "It's massive for us - the players, the chairman and the manager - we love it, it's a great thing to be part of," Lait said. "We didn't have any nerves and hopefully, the next round can be the same - we're confident. 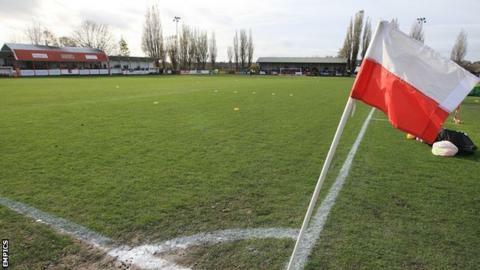 Stourbridge reached the first round of the FA Cup for the first time in their 133-year history in November 2009, where they lost 1-0 to League One Walsall. The Glassboys were back there in 2011, beating Plymouth 2-0 to reach the second round for the first time before their run was ended by Stevenage. Stevenage knocked Stourbridge out again in 2013, winning their second-round tie 4-0 after the Glassboys had beaten Biggleswade Town in the first round. Manager Gary Hackett has now masterminded four successful campaigns into the first round of the FA Cup and he says Stourbridge's latest effort feels just as special. "We waited 130 years the get into the first round for the first time and once you have a taste of it, you want more," Hackett said. "For us to reach the first round proper again, and beat our big local rivals is fantastic - it's a magnificent achievement."